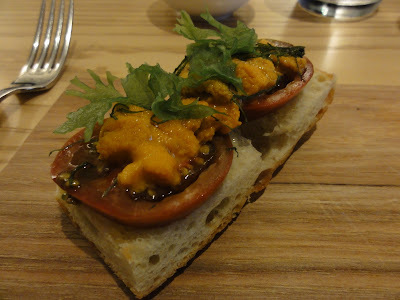 The other day I was out running an errand and decided to stop into Aldea for lunch. I'd been meaning to lunch here for a while after reading raves about the uni sandwich offered during the day. 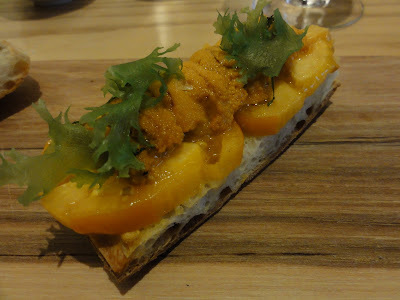 I started with the "CURED FOIE GRAS - fig "salad", lemon verbena, fig sorbet, brioche." The dish also included some crumbled cacao on the fig salad and two delicious little husk tomatoes. 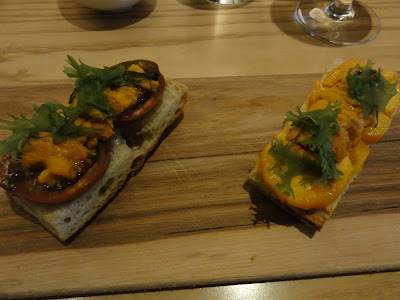 This was a very nicely composed dish, the foie impeccably prepared - smooth and luscious. 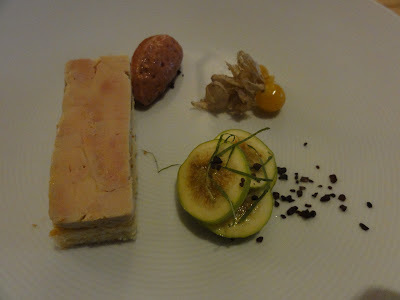 The fig components were a good complement for the rich foie and kept it on the lighter side. The husk tomatoes were a real delight, intensely fruity despite their diminutive size, and seemingly an expert crossing of a tomato and a grape in flavor. Both were excellent, and I did not have a favorite, but i enjoyed going back and forth from one to the other. 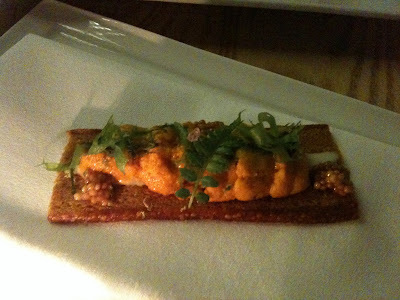 In both cases the uni tasted clean, sweet, and briny and was thoroughly delicious. It was also just barely warmed through due to a quick trip under the salamander i believe, which left it right at the edge of melting as soon as it hit your mouth and boosting the perception of the unctuous flavor. I'll certainly return to repeat the pleasant experience next time i find myself in the area around lunchtime. If serendipity does not send me there soon enough, I'll have to make a special trip.